Dunga’s Brazil continued their revitalization with their dynamic system in possession being of the most exciting features of Dunga’s side against France. 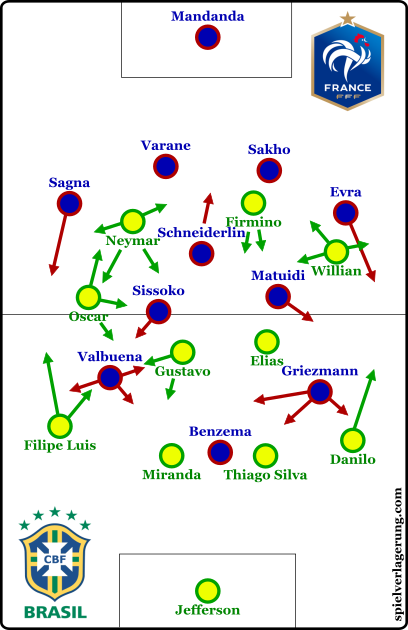 The strikerless 4-2-2-2 shape was important in their defeat of France as it incorporated and utilised the movements of Neymar, Firmino and Oscar to facilitate their possession-focused style. Didier Deschamps lined his side up in a 4-1-4-1/4-3-3 formation, with a focus on wide attacks through Griezmann and Valbuena, supported by the full-backs and ball-near midfielder. Mandanda started in net behind a defence of Sagna, Varane, Sakho and Patrice Evra. Morgan Schneiderlin played an important role at the base of the midfield, with Matuidi and Moussa Sissoko ahead of him supporting an attack of Karim Benzema, Mathieu Valbuena and Antoine Griezmann. They had the lesser portion of possession but pressed reasonably well, whilst alternatively sitting relatively well organised in a strict 4-1-4-1 formation, however they weren’t able to cover up the liability of Valbuena on the right wing. Aside from their problems of their own accord, they struggled to cope with the fluid movements and interchanging of positions by Dunga’s impressive Brazil side. Jefferson started as goalkeeper, shielded by a defence of Filipe Luis, Miranda, Thiago Silva and Danilo. Luis Gustavo and Elias formed a double pivot partnership, who were more defensively focused, allowing greater freedom in the attack of Oscar, Willian, Neymar and Roberto Firmino. The lack of an imperious striker has been much talked about following the World Cup, however in their new shape it seems like this will be much less of an issue than stated. The roles and movements of the two central forwards were quite different, with Neymar having somewhat of a focus on movements to the left flank, where he could receive the possession free of a marker, and support the developments by creating a trio with Luis and Oscar. On the other hand, Firmino was less flexible and stayed in the centre of the pitch much more, having a presence in the central overloads which were attempted occasionally, whilst not offering the same support out wide that Neymar did. The latter point may be simply down to the fact that Brazil collectively focused on the left side in possession. Aside from this, on the right they didn’t attempt as many situations for combination play, meaning that Firmino’s involvement wasn’t always necessary although the lack of it caused issues at times. With Neymar moving to the left in support, Brazil looked most threatening in these spaces. Given the excellent ability in combinations of Filipe Luis, whilst Oscar’s tactical intelligence shone in strong movements which were often in balance of Neymar’s runs towards the touchline. In the second half, Willian had a bit more involvement when the ball was left, and came into the 10 space to offer support and subsequently, he assisted Neymar for the 2nd goal of the game from the centre after breaking from the right. A situation in the 25th minute, with both Neymar and Firmino dropping. An example is evident in the above scene. Brazil look to develop on the left flank through the main trio of Oscar, Neymar and Filipe Luis, who is interestingly in the half space. Through a quick and rather simple rotation of positions, Valbuena has lost Oscar, who received the ball off of the left-back to drive into unprotected space ahead of the French defence. Central overloads were also made possible by Firmino and Neymar’s roles, as they dropped into the midfield lines in coordination with the inside movements of both Oscar and Willian. The positioning of the full-backs was important in these situations, as they stretch France and in a few specific scenes, opened up the half spaces. This was in particular an aspect down the right, where the half space was opened to allow the great Thiago Silva to use his undervalued passing game through vertical passes into Firmino and Willian behind the French midfield line. France could’ve stopped these situations from arising by having an improved horizontal compaction, especially with Schneiderlin shifting across. The movements inside to combine the front 4 in the centre was on display for Brazil’s equaliser shortly before half time, as Oscar and Firmino combined in a 1-2, whilst Neymar offered support nearby also. With Brazil’s focus on the left side, there was often an imbalance in their possession game as the right side suffered. Although there were a few cases of Thiago Silva making some excellent vertical passes into the half space, for long periods of the game they struggled to develop through the right flank. In many situations, support for the 3rd pass in combinations was lacking, with Elias rarely getting into strong positions near the ball, whilst Firmino was more oriented to the central spaces. Danilo and Willian didn’t have a good enough synergy to generate effective combinations and momentum by themselves against a stronger defence with Griezmann supporting well, alongside Matuidi at LCM. You can partly explain the imbalance as a result of qualitative differences in the team, by simply comparing the players on either wing. Filipe Luis is amongst the top left-backs in the world, and offered better in possession than Danilo. Whilst Willian and Oscar are different in what they offer, Oscar’s movements were probably more important to the system and facilitation of Neymar. Overall, the quality which the Barcelona forward brings was key, as he had a strong influence in Brazil’s possession game. In addition, it seemed that Dunga had the intentions of exploiting Valbuena’s defensive weaknesses by focusing on his side. He struggled to cope with combinations and the rotations of positions which were used, especially with Filipe Luis’ movements into the half space. Deschamps seemingly noticed this as during the interval, he had Griezmann and Valbuena swap positions so to protect their right flank more against the best trio on the pitch. 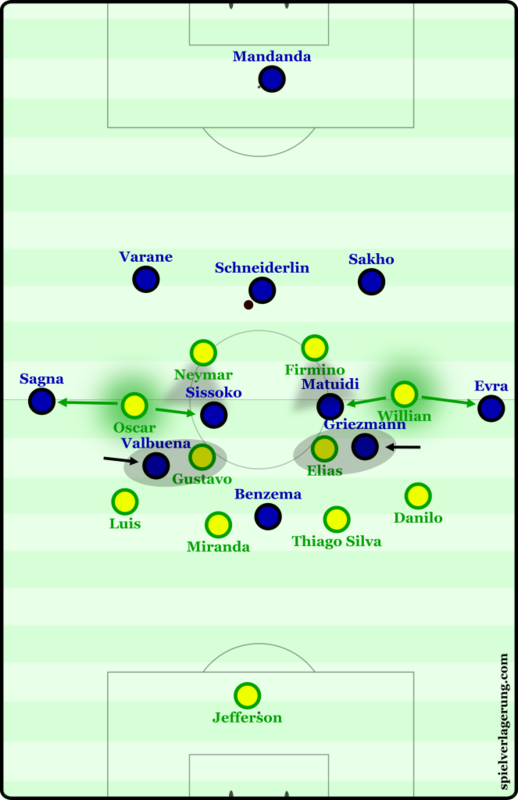 In reaction, Brazil started utilising switches of play to continue the exploitation of Valbuena on the opposite flank, with Danilo and Willian maintaining wide positions during left-sided build-ups. Poor positioning by both Valbuena and Evra didn’t make this situation any better for France, as they were rather isolated from the main block. Gustavo made a switch in the 54th minute to exploit poor positioning by Valbuena and Evra, who could rather easily be taken advantage of. The pressing of France was well set up to work against Brazil’s imbalance. Overall they were based around man-marking, with an increase in intensity on Brazil’s right in comparison to on their left. With this they could exploit the poor connections between players on Brazil’s weaker right flank, and regained possession on a few occasions in this space. 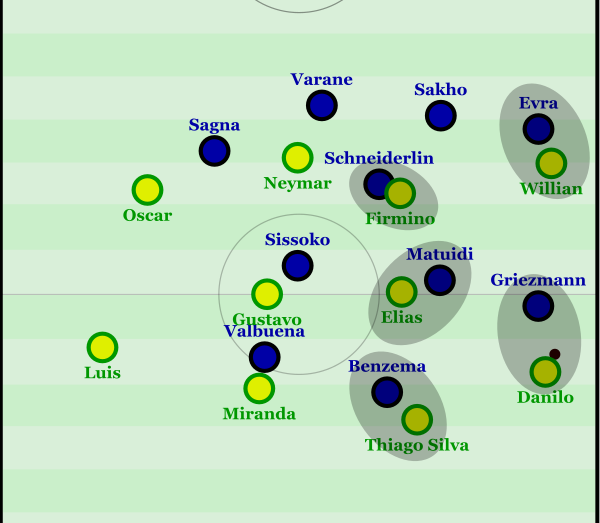 Due to the man-orientations, there were a number of threatening counter-attacks during these moments, as Brazil were somewhat slow in defensive transition, whilst France immediately had high numbers around the ball as they pressed man-to-man. France’s man-marking in their pressing. Willian and Danilo often lacked good connection and struggled to develop down this side. Although Brazil weren’t under great pressure from France, aspects of their defensive organisation were on show. They used a 4-4-2/4-2-2-2 shape, which sat in a mid to low block with Oscar and Willian quite narrow in support of the midfield. The 6 space of France was often quite poorly covered, as a result of the poor defensive work of Neymar and Firmino. They rarely made backward pressing after their line of pressure was beaten, whilst the midfield were already occupied, resulting in any receivers of passes in this space having the time to develop possession further. This was usually towards wider areas, as Oscar and Willian were dragged inside, leaving the wider spaces temporarily unstable for Brazil, however France lacked the ability to exploit such situations. The centre-backs themselves were also allowed too much freedom at times, especially in the 1st half, who were poorly pressed by the front two and often allowed to advance quite far upfield with the space to pick out a vertical or diagonal pass which could penetrate the midfield. When moving closer to the midfield without pressure from either central forward, they could generate a numerical superiority which would in turn lead to a free man in midfield, in a number of cases Sakho could utilise this. Aside from the weakness in this specific area, the 4-4-2 was relatively stable. It was especially adept at defending against France when both Griezmann and Valbuena made movements inside. The front two mainly acted to stop any passes made into the midfield from the back 3 (as Schneiderlin dropped to create the 3v2). The half-space positioning of Oscar and Willian meant that they could basically cover two positions simultaneously, as they had access to press Matuidi and Sissoko but also had the ability to move quickly out wide to stop any progressions through the flanks. This was especially so as Griezmann and Valbuena made inside movements behind Benzema, meaning that the Brazilian defence wasn’t stretched higher up, aside from this, Gustavo and Elias were already in decent positions to cover any potential passes into them. In conclusion, it is impressive to see the recovery which Brazil have made, as it is now 7 wins in a row since their defeat to the Netherlands in the 3rd place match, alongside an impressive goal difference of plus-15. The highlight of watching the game was definitely seeing Brazil’s flexible game, which a match analysis does not do the justice of analysing fully. It is highly possible that you may see a more in-depth analysis of Dunga’s system for Brazil in the future here on SV, which will allow for a better explanation of the functioning of the attack. Many thanks for the hard work of posting so many articles – in English now too. Your site is fantastic. Brazil’s funny. Having a great manager in charge before and after the World Cup at home, but in between they rely on the funny old man with the mustache.